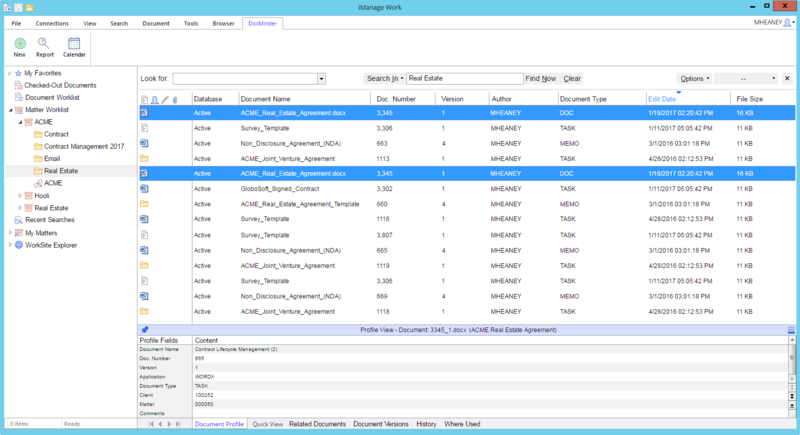 Get the power of project management right inside your document management system. 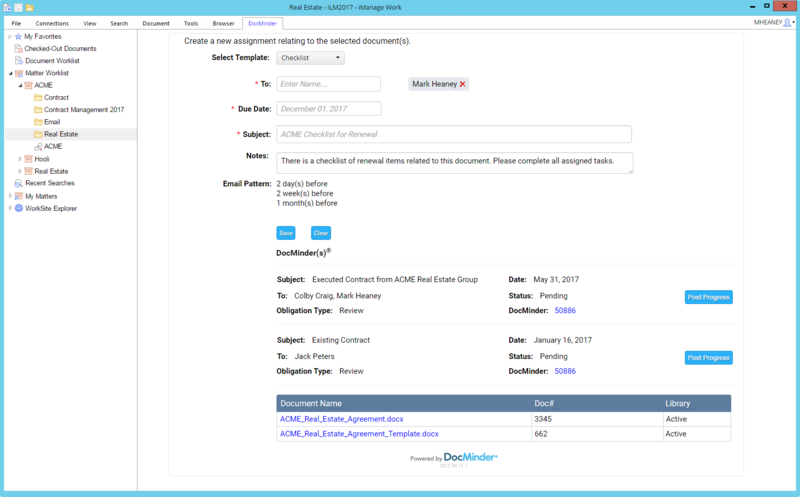 Whether you are using FileSite or DeskSite you can have the power of DocMinder® project management, the event calendar, and project reports from right inside your document management system. DocMinder® Embedded gives users and managers simple and transparent project management solution within the iManage tools they already use and are comfortable with. 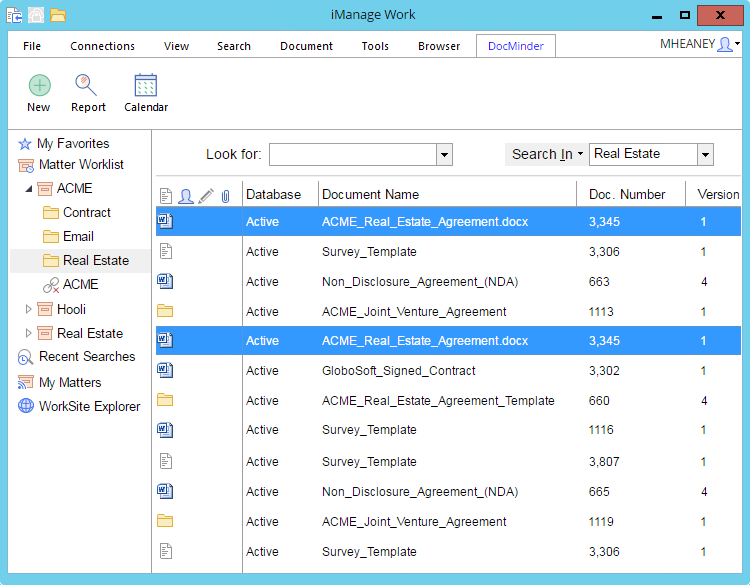 Inside an iManage folder you can select documents and create a new DocMinder® assignment related to those documents. 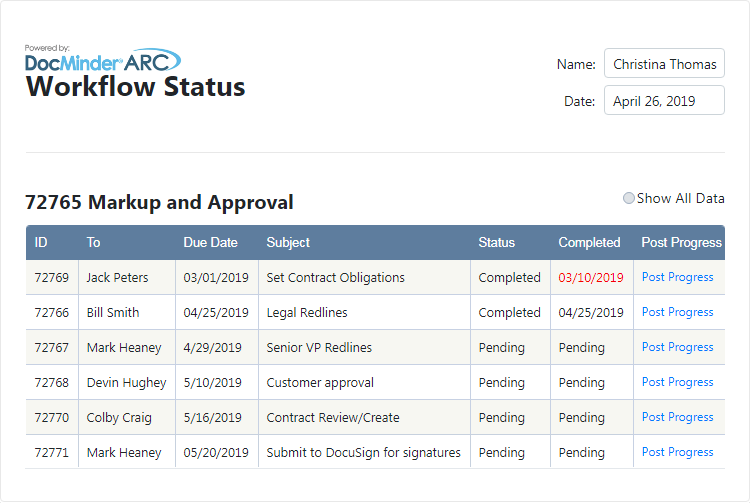 By filling in a web form with details about the task, you can define who needs to be notified, provide notes about the task and set a due date for the work associated with the selected documents. 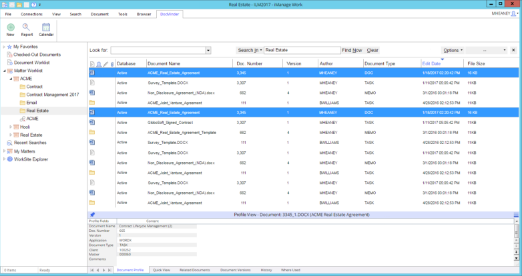 Once this task is saved, DocMinder® sends an email notification to the assigned recipient(s). The notification frequency and format of the notification emails can be defined by your company to meet your specific needs. Each notification email contains a link to the progress page for the specific task. 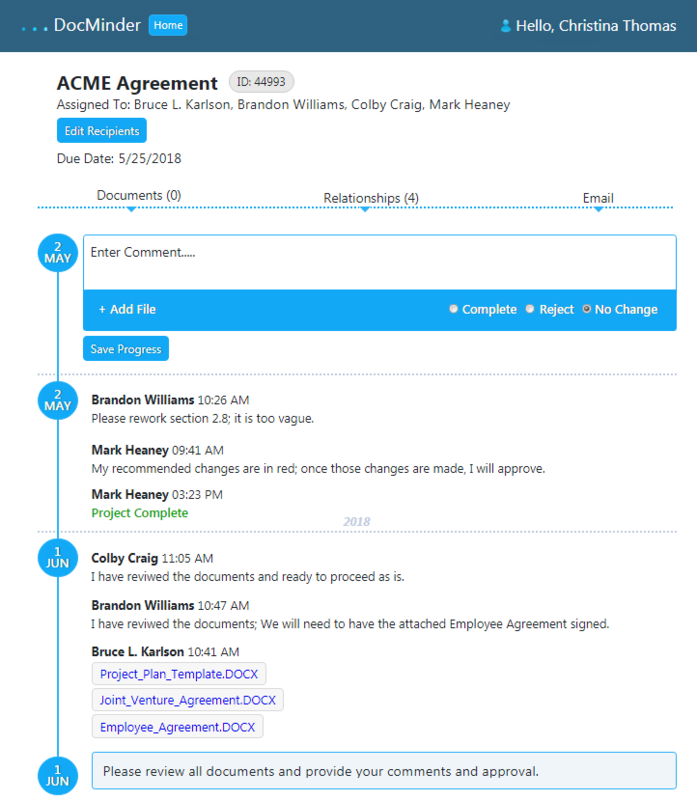 From the progress page, your team can easily update the status of their task, add comments to share critical information and complete their work defined by the task. Over time you can set up templates to simplify scheduling tasks. Task templates can be as simple or complex as you want. 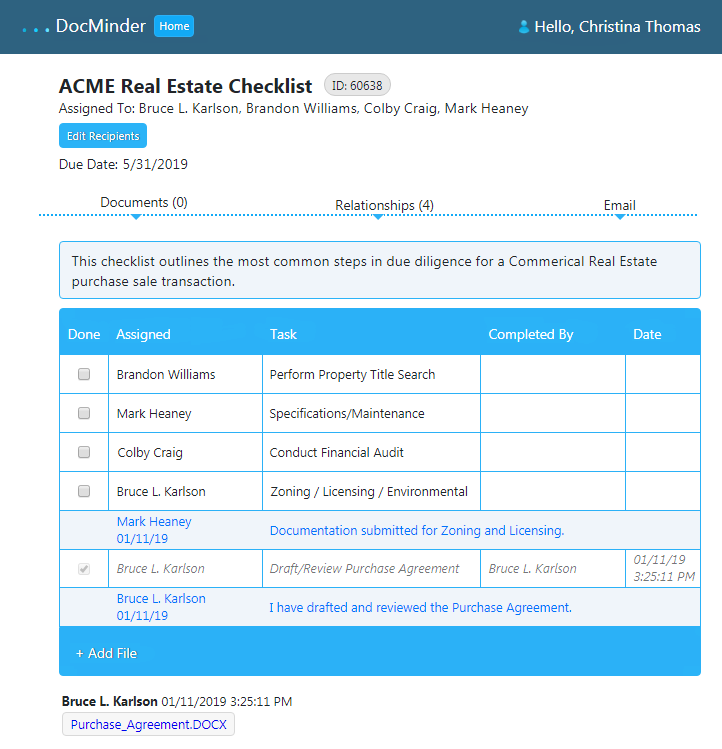 Anything from details about common processes - to full DocMinder® features such as checklists which can be set up as a template and kicked off by anyone with permission to DocMinder® Embedded. 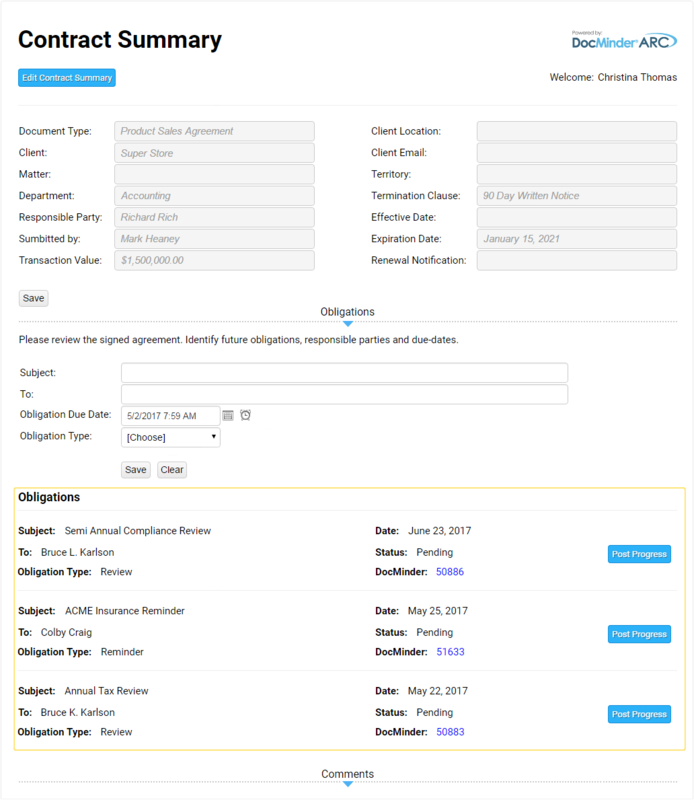 If you have a contract with several obligations, each obligation can be tracked as a different task. 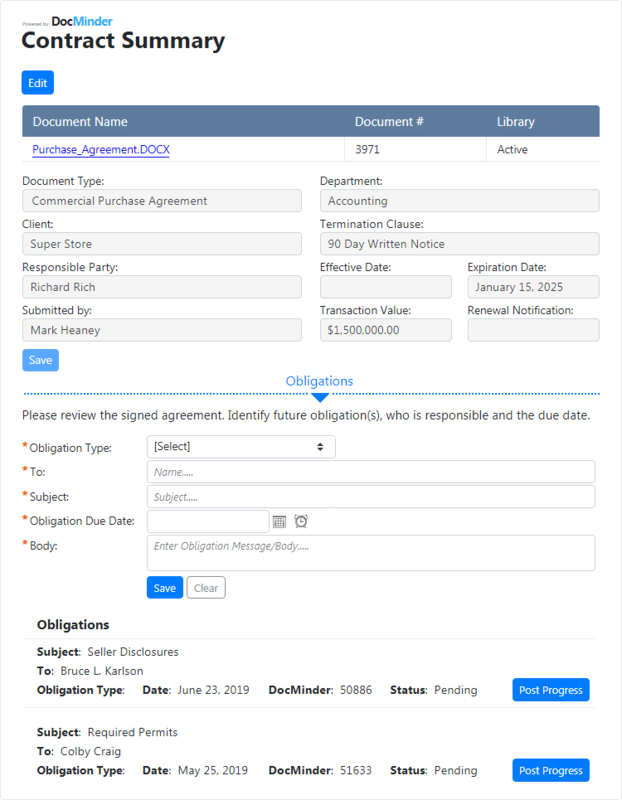 DocMinder® will keep track of all of the obligations for the contract and display them towards the bottom of the summary page. Each iManage workspace has an associated event calendar designed to display all DocMinder® tasks created for the documents associated in the workspace. The DocMinder® calendar displays your task assignments by its due date. 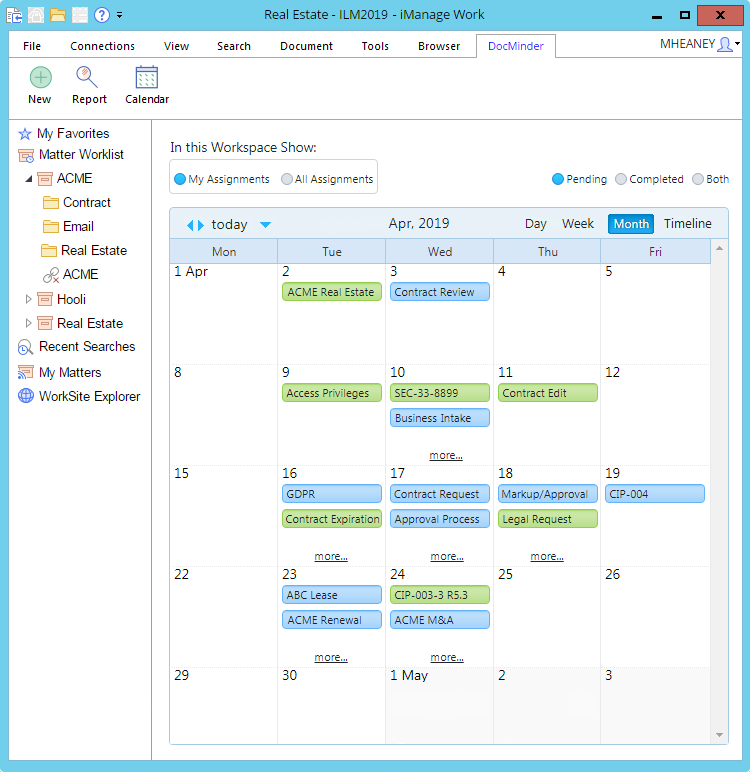 The calendar has several different filters for sorting and viewing your task assignments. 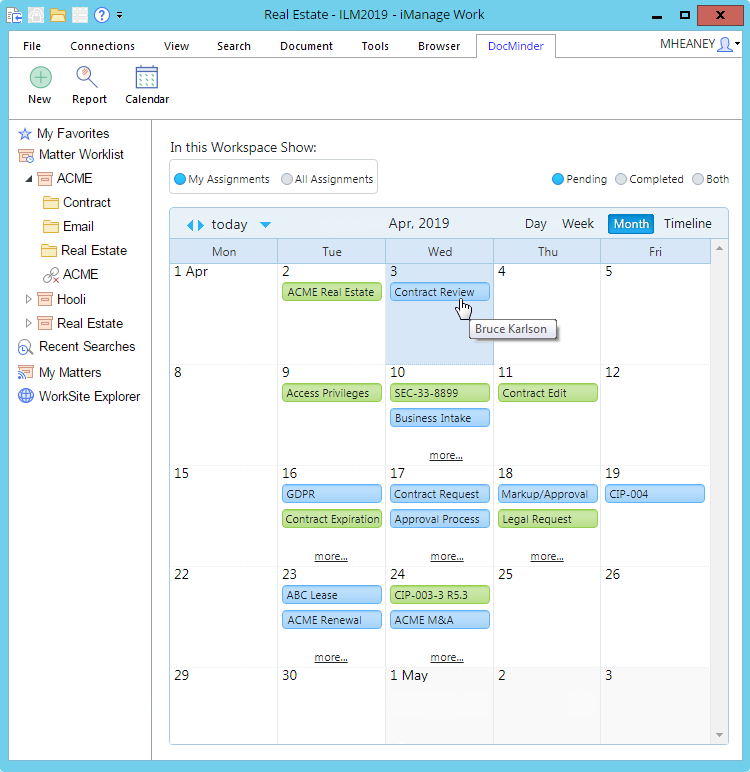 These filters may be limited to a particular workspace; but you can expand the calendar view to include all task assignments in which you are directly involved. 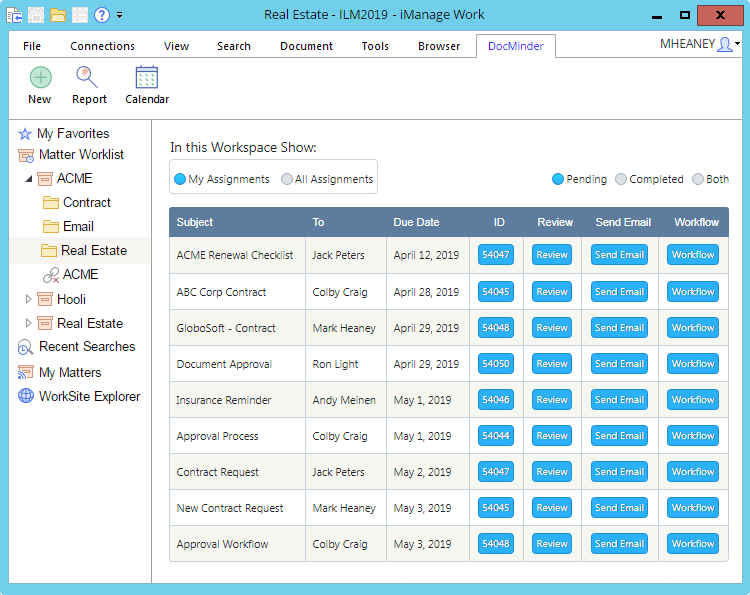 You can also view pending or completed task assignments. 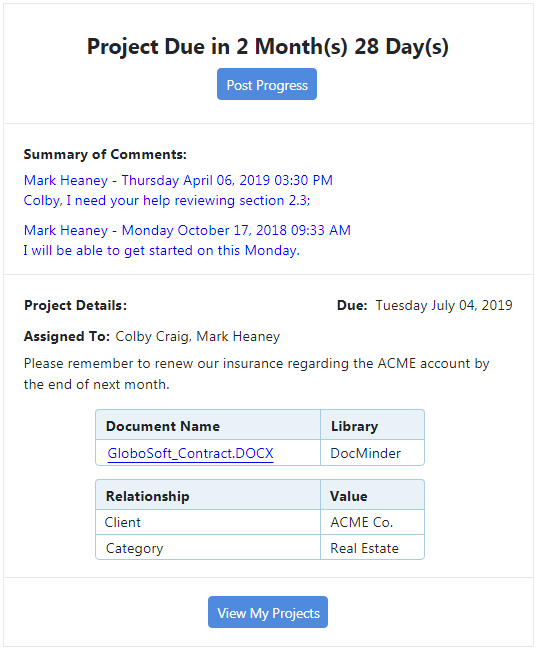 By selecting a task assignment from the calendar you can open the task's Progress Page to review previous progress updates, add new comments, or complete the task. Each workspace also has a report containing relevant information on all projects setup in the workspace. The report filters have the same functionality as the calendar, but here there are a few additional options. The DocMinder® ID number is a link button that allows manager level users to quickly edit any of the settings for this project. You can click the Review button to see the details of all the related projects on the summary page. On the review page you can click post progress on any of the previously created assignments to view them individually. Or you can set up a new assignment related to this project. If your company is using DocMinder Workflow to track a sequential workflow process, then the workflow button give you a quick way to sort the completed from the pending tasks, and allow you to click post progress so you can interaction with specific steps of the workflow.